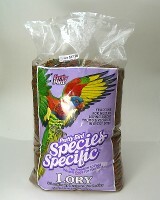 Lory Special is 16% protein and 6% fat. We use our mini size morsel that contains fructose and increased vitamins. We balance carbohydrates, fats and proteins to duplicate dehydrated fruit and pollen. The result is a well balanced food for pets as well as breeders that produces a solid stool. We refuse to use wet foods as they can grow bacteria which is harmful to birds. Corn, Wheat, Oat Groats, Soy Concentrate, Corn Gluten Meal, Fructose, Soya Oil, Coconut Oil, Raisins, Coconut, Papaya, Apricot, Banana, Sweet Potato, Pineapple, Apple, Spinach, Broccoli, Carrots, Dates, Calcium Carbonate, Dicalcium Phosphate, L-Lysine, Choline Chloride, Natural and Artificial Flavors, DL Methionine, Isoleucine, L-Threonine, L-Tryptophan, Vitamin E Supplement, Ascorbic Acid (Vitamin C), Ferrous Sulfate, D-Biotin, Yucca Schidigera Extract, Zinc Oxide, Manganous Oxide, Niacinamide, Magnesium Oxide,Vitamin B12 Supplement, Mixed Tocopherols, Copper Sulfate, Calcium Iodate, Citric Acid, Calcium Pantothenate, Vitamin A Supplement, Sodium Selenite, Folic Acid, Riboflavin, Pyridoxine Hydrochloride, Thiamine Mononitrate, Natural and Artificial Colors, Menadione Dimethylpyrimidinol Bisulfite (source of Vitamin K3), Vitamin D3 Supplement, Cobalt Sulfate, Rosemary Extract. Crude Protein (min) 16%, Crude Fat/Oil (min) 6 %, Crude Fiber (max) 3 %, Moisture (max) 10 %, Ash (max) 4 %, Vitamin A (min) 12,000 IU/kg, Vitamin D3 (min) 800 IU/kg, Vitamin E (min) 200 IU/kg, Copper (min) 10 mg/kg.